Cosmetic procedures are no longer available and affordable to only the rich and privileged. Affordable prices and excellent long-term results mean that a lot of individuals are looking to undergo some form of cosmetic enhancement to liven up their social life or even boost their confidence. You will see many of these patients and since your time and money is limited, your goal is to find the best Botox® Training program for Nurse Practitioners. Botox® and Medical Aesthetics are growing in popularity, especially with the high population of baby boomers reaching a certain age and demanding to look and feel better. Overall, NP’s who make the jump from traditional hospital and clinical jobs to the aesthetic field may feel happier, more useful and more financially stable thanks to the profitability and popularity of this booming industry. Treatment with Botox® injections have changed dramatically over the years. In the past, only plastic surgeons were the ones who could administer Botox® injections. This has changed quite a bit and these days nurse practitioners, as well as general practitioners who have received the comprehensive training can administer Botox® injections. Treatment indications are not just cosmetic and even include medical conditions such as spastic paralysis, cerebral palsy and blepharospasm, all of which fall under different medical specialties. Nurse practitioners are now forming a part of this elite group of individuals who can provide Botox® injection services. Botox® is an injectable comprised of the onabotulinumtoxinA. When injected into a muscle, such as facial muscles, it acts on the neuromuscular junction to temporarily paralyze the muscle and subsequently smooth out the skin. Botox® can temporarily improve and reduce the look of fine lines and wrinkles, and is particularly effective for crow’s feet around the eyes and wrinkles of the forehead. Results can last anywhere from 2 to 4 months, and it can leave your face looking fresh and youthful. Nurse practitioners are trusted and respected member of the medical community. With their existing credentials and patient base, it is extremely easy for them to learn about the techniques for Botox® administration. All it takes is hands-on, accredited Botox® training. One of the greatest parts about providing medical aesthetic jobs for NP’s is that it is offering nurses a career outside of the traditional areas of medicine, such as hospitals and clinics. Aesthetic medical practices can have great working hours, and offer independence and autonomy that a NP may desire to perform his or her duties. The options for jobs are plentiful, with medical aesthetic practices opening up all across the country. It can be a full-time position with great Monday to Friday hours, or can be a supplement to your shift work at a traditional hospital. Either way, the options are positive. Check out our blog on practical tips for NP’s who are adding aesthetics for a strategy to implement this new cosmetic procedure into your practice. Botox® training for nurse practitioners can take time to reach the appropriate level of service. This is because injecting Botox® alone is not sufficient. Providing a comprehensive and holistic service that has a positive impact on the patient’s life is essential. It is important the bear in mind that individuals who seek Botox® injections are looking to enhance their external appearance and possibly increase their self-confidence so it is important that the injections are administered in the right way in an ethical fashion and the patient’s satisfaction. In order for nurse practitioners to inject Botox®, they must undergo the right training. Courses such as the one offered by the International Association for Physicians in Aesthetic Medicine (IAPAM) is well-regarded not just by the healthcare professionals but also by the patients undergoing procedures. This is because the training for Botox® not just empowers the candidate with the knowledge of Botox® injection strategies would also talks about running a successful practice in an ethical fashion. In addition, the IAPAM also covers topics such as expansion strategies along with offering support once the candidate has had membership confirmed with the organisation. There has been much controversy regarding who can and cannot inject Botox® injections and with regards to nurse practitioners there are specific guidelines in different states in the United States. The medical site Medscape published an article in 2010 stating that nurse practitioners who undergo training for Botox® injections must perform them either in collaboration with other healthcare professionals i.e. doctors or physicians and under supervision. 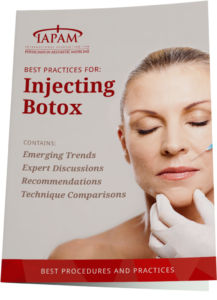 While these guidelines vary from state to state, it is important for the nurse practitioner to be aware of them and these aspects will be covered in Botox® training courses. The bottom line with undergoing the right Botox® training is to ensure that treatments are offered to patients in a safe and effective manner while being aware of the possible adverse events and offering timely treatment. It is essential to run an ethical practice that is going to be of benefit not just the patient but also by the treating practitioner. Nurse practitioners form an important part of aesthetic medical practices these days and by undergoing the right training can further their role and boost their level of confidence. I appreciate everything that you had to say here in regards to Botox injections and where you can go to become trained on how to use it. This is something that my wife is very interested in because she just wants to learn how to do it to herself. With that being said, I was unaware that there are training centers where you can learn how to do it. Thanks again for the post!